Have you ever wished you could visit certain websites faster while you’re on the go? Maybe you know a specific website you want to get to, but you don’t visit the site enough to have a bookmark for it on the home screen. Or maybe you’d rather just type as little as possible on the touch screen. Rather than typing out the full URL, and perhaps most annoyingly, the TLD (TLD stands for top-level domain, that is the .com, .net, .org suffixes across the web), use these two super simple tricks that will help you visit websites faster on the iPhone, iPad, and iPod touch. If the domain you’re trying to get to is a .com, you don’t actually have to type the .com suffix! Likewise, if the site is standardized with the www prefix, you don’t need to type that either. 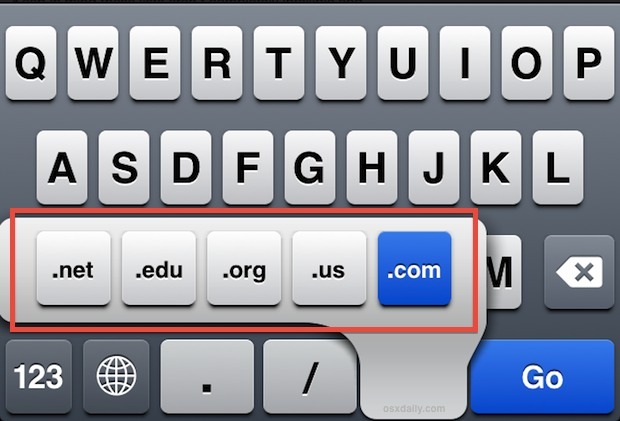 Instead, in the iOS Safari URL bar, just type the domain minus both and tap the big blue “GO” button. Safari will instantly fill in the rest, and off you go to that site. The example above will take you directly to OSXDaily.com just by tapping GO, despite not having the full URL entered. What if the domain is a .net, edu, us, or .org? No sweat, in Safari you can quickly access the 5 most common domain TLD’s by just tapping and holding the “.com” button until the sub-menu of TLD’s appears. Tap what you’re looking for, and you’re good to go. Note: the list of TLD’s shown is slightly different per country, and the country code at the end should vary widely depending on which keyboard you are using and where the device is localized to. If you end up visiting a particular site often (like OSXDaily.com! ), just bookmark it onto your home screen. Then you just have to tap the icon, there just isn’t a faster way to visit websites in iOS. All you need to do is visit the site in question, tap the share arrow, and choose “Add to Home Screen” and it’ll be there like any other app. So you are saying that either the www or the .com can be subtracted from the website (and that either must be entered) for it to work? Yes you are right, thanks for the correction! You get 8 TLDs on the iPhone 5 too when you hold down the “.com” button. On an iPad in the US, I only have 4 TLD’s. Meh. I grew tired of Safari long ago. I switched over to Unscript. I have created an app called Z:wordz that makes sharing and accessing URLs easier. The app allows you to link the URL with a memorable phrase. Then once you enter the phrase into the app, it takes you to the website.